So this month was definitely my favorite Lucky Stars Block. I have been making the cute and tiny 6.5" version of the pattern. Every month I am surprised how small those little templates are. Here are my blocks from January to the present. I didn't make the practice block; depending on what I decide on for the final layout, I may go back and make it in the end. 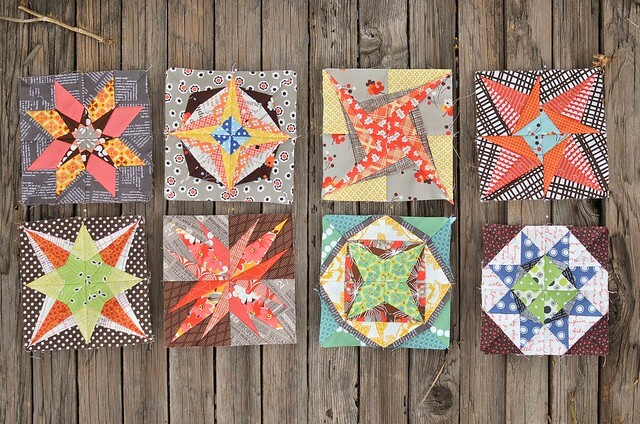 I can't remember if I've mentioned this before, but my inspiration for the colors in the blocks comes from the colors in Denyse Schmidt's Flea Market Fancy line andI have used one FMF print in each block. I did end up adding the darker blue color just because I felt like it. I also put together a couple gemstone blocks as requested by Lynn for do. Good Stitches. These were quick and fun and I love that she requested that the colors be scrappy and rainbow-y. Can you believe it is August already? I feel like I say that every month, but wow this year is flying by! This is the first time I have participated in a block of the month and I have really loved it. Have you ever participated in one? Are there other good ones out there? I would love to do another next year. Your August block is lovely, and your blocks look fantastic all together. Love the gemstone blocks too! Oh man, I love your color scheme for your star blocks! They have a hint of autumn in them for sure! I have never done a BOM, but think they look like fun. Your blocks are fantastic together! It's great and I can't even see where any seams don't line up! 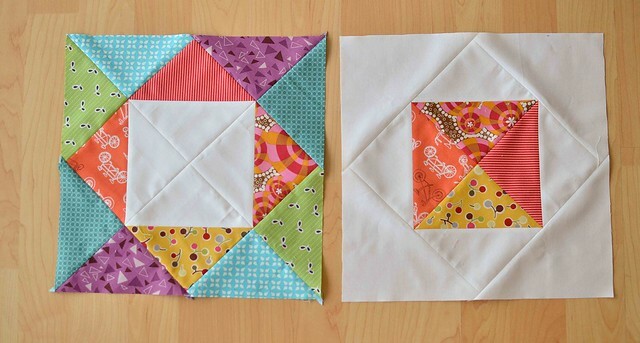 I really really like the idea of using one FMF per block and then adding your stash fabrics. 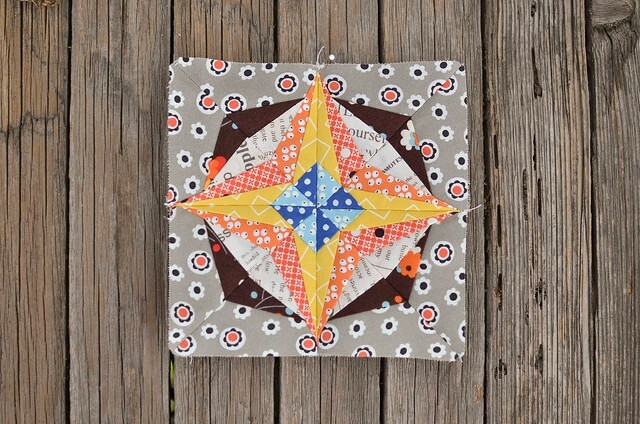 That is such a great way to keep a cohesive color scheme without relying too heavily on the designer's line or ending up with a quilt that looks too much like the other quilts out there made with the same line. Those stars are so gorgeous! Very nice blocks Erica. The stars are beautiful! Love your star - yours are totally my favorites!! I'm doing two BOMS this year, my first ones, and I have been loving it. One is a mystery quilt and it has been fun seeing the new blocks every two weeks. Your stars are lovely, and the pop of blue is perfect! I wanted to do the lucky stars, but it would've just been too much. I just love your stars Erica!